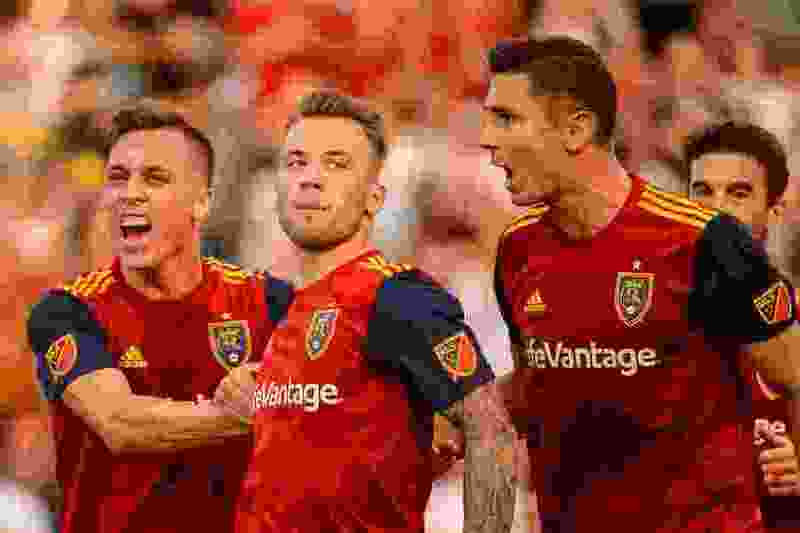 (Trent Nelson | Tribune file photo) Real Salt Lake hosts FC Dallas, MLS soccer at Rio Tinto Stadium in Sandy, Saturday July 7, 2018. Real Salt Lake forward Corey Baird (27), Real Salt Lake midfielder Albert Rusnak (11) and Real Salt Lake midfielder Damir Kreilach (6) celebrate a penalty kick goal by Rusnak. Houston • Last season, Real Salt Lake could have been described as a middle-of-the-road goal-scoring team. The 55 goals it scored wasn’t the worst performance in the league — or even just the Western Conference — but it wasn’t the best. It’s arguable, however, that the 55 number is better than advertised because RSL played without a so-called true striker in 2018. So coming into this season, with the signing of Sam Johnson and the bevy of attacking options that coach Mike Petke has at his disposal, Real has some interesting decisions to make throughout the season. Saturday’s draw against the Houston Dynamo might have provided some glimpses into how RSL’s coaching staff plans to navigate this problem. The team started with Corey Baird and Jefferson Savarino on the wings, Albert Rusnák attacking in the middle, and Damir Kreilach in the most forward position. Johnson subbed in and played 23 minutes, but the expectation is that he will eventually appear in the starting lineup. Until then, though, the attacking four RSL utilized against the Dynamo could be what fans see in the near future. That familiarity could have contributed to the team’s overall performance on the attack. RSL tallied 14 shots, five of them on goal. Houston defenders blocked five shots. Rusnák and Savarino combined for seven shots. Those chances put constant pressure on Dynamo keeper Joe Willis, who had four saves. RSL also distributed the ball in a manner that created good chances. As a team, Real had 10 key passes, the majority coming in the attacking third of the field. Rusnák had half of those passes. Throughout the game, Baird and Savarino switched sides of the field. At times, Baird also could be found in more of a central position, particularly on defense. Petke said Baird switching positions came partly by design and partly through the natural flow of the game. Baird and Savarino, Petke said, have the autonomy to make those decisions in the moment. Petke said he liked the way his four attackers played on defense and how Baird and Savarino stretched out Houston’s back line. Petke added that the team could have found a way to get Rusnák the ball a bit more. Things can certainly change depending on opponents and how players perform during training sessions. Joao Plata and Sebastian Saucedo, who were listed as subs Saturday, both saw time in the starting lineup last season and have been solid attacking options when they have played. But for now, it appears the combination of Baird, Savarino, Rusnák and Kreilach gives RSL plenty to work with.